Foreword Musea Brugge places high value on increasing the understanding of its varied collections and disseminating this knowledge through exhibitions, scholarly conferences and publications such as this catalogue. Since 2012, the Bruges Print Room has been systematically investigating and digitising its varied collection in order to garner more knowledge and to make its contents accessible to the public. Recent presentations such as The Seventeenth Century as Seen through the Eyes of Jacques Callot (2013); Virtuoso Mannerism. Prints by Hendrick Goltzius and His Contemporaries from the Groeningemuseum (2014) and ImPRESSive. New highlights from the Bruges Print Room (2015–16) have showcased the diversity and quality of our holdings while also piquing the public’s interest in the collection of works on paper found in Bruges. Currently consisting of approximately 20,000 works, the foundation of the Bruges Print Room is the major donation by John Steinmetz in 1864 of his collection of prints and drawings to the City of Bruges. The initial Steinmetz gift of approximately 14,000 prints and 1,000 drawings has, over the years, been augmented by subsequent donations and purchases, such as, most recently in 2014, the important acquisition of prints from the Bruges-based print dealer and collector Guy Van Hoorebeke. The Bruges Print Room includes a wide array of works on paper from the 15th through the 20th century, 4,000 of them drawings. About 3,000 drawings were catalogued in 1984 by the late Carl Van de Velde in his two volume catalogue, Stedelijke Musea Brugge. Steinmetzkabinet. Catalogus van de tekeningen. Still the most complete reference work of the drawings in the Print Room, Van de Velde’s publication is an impressive display of the author’s extraordinary knowledge as an art historian and a source of inspiration for younger scholars. Unfortunately, the publication is not widely known, however, as its brief descriptions are currently only available in Dutch. While most of his attributions remain accurate, his findings have become outdated in several cases. Thirty-five years after Van de Velde’s catalogue was printed, ongoing research has led to new attributions as well to the identification of hitherto unknown subjects of a number of drawings. 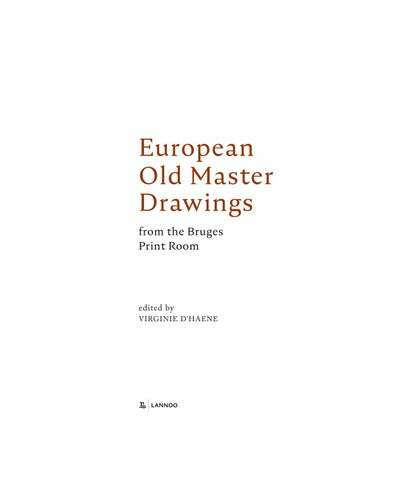 The most relevant of these new findings are included in the present volume, which highlights a selection of fifty of the most relevant and most beautiful drawings from the 16th through the early 18th centuries in the Bruges Print Room. This project was initiated by the Flemish research centre for the arts of the Burgundian Netherlands, whose mission is to initiate, stimulate, facilitate and disseminate research related to the arts, history and culture of the Burgundian Netherlands. Virginie D’haene started the reinvestigation of the drawings during her tenure as Assistant-Curator of the Print Room in Bruges and as a staff member of our Flemish research centre. We would like to congratulate her on her work as an accomplished scholar of drawings and thank her for her enthusiasm and unwavering dedication to this project, which continued on even after her professional transition to the Museum Plantin-Moretus in Antwerp in early 2018. We also would like to express our sincere gratitude to the members of our scholarly advisory board – distinguished scholars from museums, universities and the art market – as well as all other contributors for sharing their invaluable expertise. Of all the colleagues at Musea Brugge who deserve our thanks, we would like to single out Evelien de Wilde, Anne van Oosterwijk and Geneviève Callewaert for organising and facilitating the exhibition that is mounted in the Arentshuis on the occasion of this catalogue. Special thanks go to Vanessa Paumen for the coordination of the catalogue and her critical reading of all entries. We are grateful to Lannoo Publishers for their diligent work. While this catalogue was in its editing phase, we were saddened to learn about the death of Professor Carl Van de Velde. We would like to dedicate this volume to his memory, with gratitude. works were more likely to have come from the studio or circle of the artist to whom they had previously been attributed, whereas the sheet that was only tentatively attributed to Pierre Mignard in the past (no. 34) could now be assigned to him with confidence. Iconographic puzzles were resolved; the iconography of other subjects was fine-tuned or explored in more depth and, for still other drawings, new iconographic interpretations were carefully formulated.3 Finally, for many drawings, better insight was gained into their possible function and original context. In other words, there turned out to be more than enough material for a new, more in-depth and completely up-to-date publication on the collection of old master drawings. With its new status quaestionis, this catalogue contributes to our knowledge of draughtsmen and drawing practices from the 16th to the early 18th centuries. However, this study is not intended to be the final word on the subject – rather, it is an intermediate stage in an ongoing research process. Future research will confirm or refute the interpretations made here and perhaps shed further light on the many issues that remain to be resolved. the fact that Steinmetz regularly bought these drawings in bulk lots. At the auction of the estate of the Ghent surgeon Frans Bernard van Coppenole (1777–1824) on 7 February 1825, for example, he bought at least 230 drawings, of which only five could be identified – amongst them the Transfiguration by Maerten de Vos (no. 15).7 He bought the other drawings in lots with descriptions such as Vingt dessins par differents Maîtres (Twenty drawings by different Masters) or Neuf dito (Nine, ditto). At the auction of Charles Van Hulthem’s collection on 8–22 June 1846, one of the most important print and drawing auctions in Belgium in the 19th century, Steinmetz acquired some forty drawings. In addition to several bulk lots, he also bought identified drawings, including the sheets by Govert Flinck (no. 28) and Abraham Rademaker (nos. 49 and 50). Through Steinmetz’s inscription V.H. on the back of the mountings, other drawings from this auction could also be traced, such as the (still) anonymous Two Niches with a Caryatid and Female Term Figures (no. 7). His annotated auction catalogue shows that Steinmetz paid low prices for the drawings he bought at this auction – even less than for several of the prints he bought there. It therefore seems likely that Steinmetz acquired his drawings mainly as an addition to his overview of Western art history based upon prints. More Recent Acquisitions Five drawings (nos. 10, 13, 31, 35 and 47) from the selection do not come from the Steinmetz donation.8 Three of them are the result of the Print Room’s intensified acquisitions’ policy in recent years – a good example being the acquisition of Guy Van Hoorebeke’s collection in 2014, comprising more than 2,000 prints.9 In 2014, and very recently in the autumn of 2018, two unknown sheets from private collections (nos. 10 and 13) from the Story of Esther by the Italian draughtsman Giovanni Guerra were acquired at auction from Christie’s and Dorotheum respectively, becoming an addition to the two drawings from the same series that were already in the collection. Again in 2014 – and this is the most beautiful recently acquired old master drawing – the Parisian gallery Laura Pecheur donated a sheet by Cornelis Schut (no. 31), which comes from the artist’s large studio stock, part of which was auctioned in Paris in 2010. The collection’s first drawing by Schut (not included in the catalogue), a sheet related to Schut’s painting The Coronation of the Virgin in the Onze-Lieve-Vrouw-ter-Potterie church in Bruges, was acquired at that auction. Key Works by Little-known Draughtsmen Steinmetz’s irregular acquisition of old master drawings produced a small, atypical collection that varies in quality and is highly diverse in terms of school, technique and function. As noted earlier, in addition to a few prominent names such as Jacques Callot, Frans Floris or Govert Flinck, its main assets consist of a few rare, key works by lesser-known draughtsmen. Amongst the highlights is Inquiry Uplifts Science by Jan van Mieris (no. 42), made in preparation for his signed painting in Leiden, which is the key work for the reconstruction of the artist’s drawn oeuvre, a limited corpus comprising only twelve works.10 The relatively unknown artists Johan van Lintelo and Louis de Deyster, by whom only a very few drawings are known – and for the latter, only a handful – are both represented by a key work (nos. 24 and 41): respectively a signed and dated early sheet, and a drawing that can be linked to both a print and a painting by the artist. The Print Room also holds a preparatory study by the French court painter Pierre Mignard (no. 34) for the figure of Apollo in the eponymous gallery of the no longer extant Château de Saint-Cloud, which the artist painted for Philippe d’Orléans, brother of Louis XIV. It is a drawing that offers us a unique insight into the artist’s remarkable workshop practices. The fragment of a cartoon (no. 30) by Theodoor van Thulden, mentioned above, offers rare evidence of the artist’s activity as a designer of stained glass. To this can be added rare, early drawings by Maerten de Vos (no. 15) and Roelandt Savery (no. 18), an exceptionally fine Lambert van Noort (no. 6) and a particularly lively drawing by David II Teniers (no. 27) – which, according to Pierre-Jean Mariette, was already a rarity in the 18th century. Drawing as the Father of All Arts The collection’s other great advantage is that, despite its limited size, it illustrates quite well the great wealth of the drawing medium, with its admixture of techniques, formats, functions, styles and diverse subjects. Drawing – being the true ‘father of all arts’ 11 – emerges as the most essential part (and trace) of the artist’s creative process in producing nearly every kind of artwork. The range of works includes: designs drawn with a brush or in pen, red or black chalk on a pale, blue or grounded paper, for paintings, altarpieces, murals and ceiling paintings, and miniatures; designs for all types of printed matter – to be executed in various graphic techniques – from prints for allegorical or religious series to book illustrations and prints for offering and wedding occasions; designs related to the production of stained glass; and finally designs for objects in gold or silver. In addition, there are also a few drawings that were probably never intended as preparation for a work of art in another medium, but rather as works of art in their own right – known as presentation drawings. Finally, several studio drawings and copies were also included in the catalogue. They not only grant us valuable insights into the studio practices of artists from the 16th to the early 18th centuries, but are also unique ricordi of artworks no longer known to us today. Records of the Artist’s Creative Process The works in the catalogue illustrate the artist’s quest, from collecting the first ideas and motifs on paper to making several composition studies to drawing up the final design for the artwork. Collecting Ideas and Motifs on Paper Ideas and motifs were often collected by copying other works of art, from prints, paintings and sculptures to other drawings. A prime example is Studies after Antique Sculptures by Frans Floris (no. 2), a testament to the sculptures from classical antiquity that the artist saw during his Roman sojourn and recorded on paper in order to incorporate them into new, ‘modern’ compositions when he returned to the Netherlands. Artists also collected motifs by drawing from life. The anonymous draughtsman of Figure Studies (no. 26) presumably installed himself near a market, sketchbook in hand, while Teniers sketched the activities of a brickmaker (no. 27) – which he then deployed in his painting without further adjustments. Both sheets have a sketchbook format, but artists also made larger figure studies, as the sheets by Flinck (no. 28) and the circle of Furini (no. 29) attest. Figure studies and copies like these were used not only to create an image database of sorts (with or without a specific project in mind) but also as a way of exercising the hand. Wandelaar (no. 48) camouflaged his earlier ideas by means of pasted-on pieces of paper on which he drew an alternative solution. The Design for an Altar by Hendrik Frans Verbrugghen (no. 36) is a typical, early-stage architectural drawing that presents (to the patron?) a choice between different possible designs. That minor and even major adjustments were made until the final stage before or during the execution of the work of art is evident, for example, in the slight differences between the print and the apparently final design by Cornelis Dusart (no. 45), or the hastily sketched Inquiry Uplifts Science (no. 42), to which Jan van Mieris made a substantial change to the iconography in the finished painting. Drawings often served as a means of communication between the patron and artist, and some of these adaptations may have been made upon their request. In some cases, we are fortunate enough to have several preparatory drawings for the same work, which gives us a good impression of the different stages of the production process. For Jacques Callot’s (probably) never-executed print Admiral Jacopo Inghirami Presenting Berber Prisoners to Ferdinand I de Medici, three composition studies are, for example, preserved, one of them kept in Musea Brugge’s Print Room (no. 23). The differences between these three illustrate beautifully and quite visibly the way in which the artist arrived at a balanced composition. Compositions were transferred from one support to another by means of squaring, as in the case of Trotti’s David (no. 8), or by making incisions in the drawing and covering the reverse with red or black chalk so that the composition could be transferred to a new support. The latter is the case for nearly all the designs for prints included in the catalogue. For large works of art, such as stained-glass windows or tapestries, a cartoon was often made – a final, life-size design that served as a guideline for the execution of the work of art. Sometimes these assumed monumental proportions. One indication of this is given by the Head of a Shepherd (?) by Theodoor van Thulden (no. 30), which is a fragment of such a cartoon for an unknown stained-glass window. prints – producing as it were luxurious, hand-drawn, unique editions of prints. Giovanni Guerra’s sheets illustrating the Old Testament Story of Esther probably served a similar function – namely as hand-drawn biblical illustrations meant for collectors. Studio Drawings and Copies Several studio drawings and copies have also been included within the catalogue. Although these are of lesser quality, they offer valuable insights into the production process and the studio practices of artists. An Old Man with Glasses and a Stick Walking among Ruins after the Master of the Clinging Draperies (no. 1), for example, is clearly a copy after another work but is nevertheless particularly instructive with respect to copying practices of the time. Namely, the sheet seems to have been soaked in an oily substance to make it transparent, so that the underlying composition could be easily transferred. Moreover, the works of art related to the drawings have often been lost, or are (still) unknown. (Studio) copies such as the aforementioned, An Old Man with Glasses and a Stick Walking among Ruins, or the Mythological Scene (no. 3) after a work by Primaticcio, are therefore unique ricordi of artworks that are no longer known today. 1 Van de Velde 1984. 2 Nos. 1, 3, 4, 16, 19, 25, 30, 33, 34, 35, 37, 38, 39, 40 and 46. 3 Changes in the description of the iconography were made for the nos. 1, 9, 10, 11, 12, 13, 17, 36, 37, 40, 42 and 48. 4 For a good introduction to the life of John Steinmetz and his print collection, see Le Loup 1979. 5 For a proper overview of the provenance of the drawings from the Steinmetz collection (and other drawings from the Print Room of Musea Brugge), see Van de Velde 1984, pp. 7–16. 6 For a solid introduction to the collection of neoclassical drawings of the Bruges Print Room, see D’haene 2014. 7 Van de Velde 1984, p. 8. 8 It should be noted here that it is not always entirely clear which drawings come from the Steinmetz donation; see Van de Velde 1984, p. 13. 9 For an overview of the highlights of this collection, see D’haene/De Wilde 2017. 10 The drawings by Teniers, Lintelo, De Deyster, Van Thulden and Savery mentioned in this section were included in the provisional list of recognised masterpieces of 17th-century drawing, commissioned by the Arts and Heritage division of the Flemish Government. The drawing by Maerten de Vos was already recognised as a masterpiece by the Flemish Government in 2015, see http://www. kunstenenerfgoed.be/en/node/27513. 11 This (famous) quote is taken from Karel van Mander’s chapter on drawings in his manual on painting, Den Grondt der Edel vry Schilder-const, which forms part of his Schilder-boeck, published in 1604. Note to the reader Selection The works chosen for inclusion in the catalogue are limited to drawings by European artists born in the 16th and 17th centuries. This criterion permitted the inclusion of a couple of early 18thcentury sheets in the selection, but likewise excluded the large quantity of drawings by artists who studied at the Bruges academy, established in 1717, which merits a future study of their own. Order The drawings are broadly arranged chronologically in the catalogue, with sheets from different schools placed alongside each other. Such an arrangement shows the extent to which drawing practices from the 16th to the early 18th centuries crossed boundaries, though it also reveals regional differences. Exceptions in the chronological placement are sometimes made for the purpose of maintaining visual continuity. Authors The entries were written by Stijn Alsteens, Ellen Bakker, Yvonne Bleyerveld, Till-Holger Borchert, Jean-Claude Boyer, Hans Buijs, Dominique Cordellier, Julie Daems, Heleen De Smet, Evelien de Wilde, Virginie D’haene, Charles Dumas, Peter Fuhring, Stefaan Hautekeete, Margret Klinge, Marjolein Leesberg, John Marciari, Maja Neerman, Julie Rooryck, Kristel Van Audenaeren, Anne van Oosterwijk and Sarah Van Ooteghem. Dating Where possible, a date is mentioned for the artworks depicted in this book. Dates that are the result of art-historical research are preceded by ‘c.’. In some cases, it was not possible to situate a work within the career of the respective artist, not even approximately. For these works, the date has been omitted. Exhibitions and Bibliography In the categories ‘Exhibitions’ and ‘Bibliography’, the artist’s name and title of the work are only mentioned when these differ from the current attribution or interpretation of the iconography of the drawing. The ‘Exhibitions’ category is omitted when the work – as far as we know – has never been exhibited. Images Where possible, the selected drawings from the Bruges Print Room are reproduced at their actual size. Colophon Concept and editorial supervision: Virginie D’haene Authors: Stijn Alsteens, Ellen Bakker, Yvonne Bleyerveld, Till-Holger Borchert, Jean-Claude Boyer, Hans Buijs, Dominique Cordellier, Virginie D’haene, Julie Daems, Heleen De Smet, Evelien de Wilde, Charles Dumas, Peter Fuhring, Stefaan Hautekeete, Margret Klinge, Marjolein Leesberg, John Marciari, Maja Neerman, Julie Rooryck, Kristel Van Audenaeren, Anne van Oosterwijk, Sarah Van Ooteghem Advisory board: Stijn Alsteens, Till-Holger Borchert, James Faber, Stefaan Hautekeete, John Marciari, Gregory Rubinstein, Peter Schatborn, Manfred Sellink Conservation and support: Geneviève Callewaert, Ann Peckstadt and Nadia Vangampelaere Photography: Dominique Provost Translation: Irene Schaudies Text editing: Virginie D’haene, Robert L. Fulton, Jr., Vanessa Paumen Picture research: Sandra Darbé, with the assistance of Virginie D’haene and Julie Rooryck Publication coordination: Vanessa Paumen Graphic design: Leen Depooter – quod. voor de vorm. © Lannoo Publishers, Belgium, 2019 D/2019/45/97 – NUR 640 ISBN 978 94 014 5934 1 www.lannoo.com Go to our website and sign up for our regular newsletter with news about new and forthcoming publications as well as exclusive offers. If you have any questions or comments about the material in this book, please do not hesitate to contact our editorial team: redactiestijl@lannoo.com. All rights reserved. No part of this publication may be reproduced or transmitted in any form or by any means, electronic or mechanical, including photocopy, recording or any other information storage and retrieval system, without prior permission in writing from the publisher. This catalogue is a publication of the Flemish research centre for the arts of the Burgundian Netherlands, Musea Brugge, with the support of the City of Bruges and the Flemish Community. With special thanks to the Museum Plantin-Moretus and the City of Antwerp.